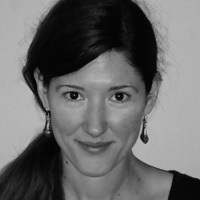 Megan Gannon‘s poems have appeared in such publications as Pleiades, Ploughshares, Crazyhorse, Seneca Review, Laurel Review, International Journal of Feminist Politics, and The Best American Poetry 2006. Recent poems are forthcoming in The Notre Dame Review and Sonora Review. She served in the Peace Corps in The Gambia, West Africa, graduated from Vassar College and the University of Montana, and is currently a PhD candidate at the University of Nebraska-Lincoln.